Turning the 2018 Chevy Trax into an Off-Road Warrior? This was the claim made in an article I’d recently read, which positioned (of all things) the Chevy Trax as a worthwhile consideration for prospective buyers looking for a competent off-roading vehicle. And while I may (or may not) have needed an emergency tracheotomy after swallowing a pretzel nugget during a fit of reactionary laughter at such a ridiculous premise, it shines a light on certain automaker failings when it comes to the enthusiast community. It’s been the better part of a year since certain automakers started to announce aggressive strategies calling for the mass-culling of their lineups to make way for crossovers, hybrid and EV offerings that we more aligned with evolving consumer sensibilities. Of course, one of the first to make such an announcement was General Motors, touting cuts across the Chevy, Buick and Cadillac lineups. 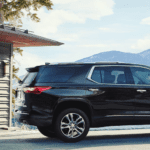 So, if the plan is to focus on accessibly-priced, versatile and eco-friendly offerings, one might be tempted to take a closer look at GM’s success-to-date in order to gauge the merit of their strategy. Bolstered by the recent string of hi-po’d offerings, especially those grown from FCA’s various lineups, there is a reinvigorated customer base obsessed with juiced-up models being served up across all segments, from the Hellcat to the Trackhawk to the TRX. And while enthusiasts of these horsepower battles may be legion in their numbers, we still represent a niche demographic. The same could be said for off-roaders and overlanders, also best served by FCA. So, when we turn our attention to Chevy’s lineup (for example) and seek out the MOST accessibly-price, MOST economical and (arguably) MOST eco-friendly of their crossovers, the Chevy Trax, there are some inherent challenges in appreciating its advertised strengths. Why? Because lacking power and (regardless of what some writers might claim) ‘off-road warrior’ credibility, it just doesn’t represent my tastes. But if the Trax is indicative of the proverbial basket in which automakers seem to be placing many of their eggs in, it might be deserving of a closer look. After all, I am capable of side-stepping subjectivity and finding a silver lining. Right? Chevy describes the 2019 Trax as “a compact SUV with some serious gusto” going on to state that it “offers performance pep for a fun driver, technology to keep you entertained and available safety features to help you stay confident”. It also wraps up its self-endorsement by pointing out that “with all this energy, you can explore every corner of your city without missing a beat”. Okay, okay…you had me at ‘serious gusto’ and ‘performance pep’. So, what can we expect to find under the hood? Based on the description it should have a ballsy V6, at least, right? Of course not. Across all trims the Trax is equipped with a 1.4-liter Turbo ECOTEC 4-cylinder paired to a six-speed automatic transmission. And while that powertrain is described as delivering “maximum torque across a wide rpm range for lively driving response and performance’, you’ll have to excuse me if I’m not blown away by 138hp and 148 lb-ft of torque. So, let’s address the prior claims that the Trax was worthy of consideration to anyone searching for the perfect off-roader. There is, of course, the option of AWD which earns the Trax some points in terms of terrain versatility. Unfortunately, the Trax’s ground clearance maxes out at 6.2-inches (a full 2.5-inches less than the Subaru Crosstrek) ranking it among the lowest-seated offerings in the segment. So, to be the clear, the Trax (i) lacks suitability as an off-roader, and (ii) calls Chevy’s own assertion of performance into question. If I’m being completely honest, I’m feeling pretty vindicated in my criticism, thus far. But let’s focus on the areas where the Trax garners its praise. First off, it would be hard to argue the accessibility of a $21,300 starting price point (for the base LS trim). Even the line-topping Premier Trim is priced to start at $28,595 MSRP which exceeds only the starting point of the Equinox, placing the Trax comfortably below the remainder of its Chevy stalemates. So, yes – this is inarguably a crossover that is priced to compete. So, let’s turn to fuel economy. With the aforementioned powertrain, the 2019 Chevy Trax earns an EPA-estimated 31 mpg highway and 25 mpg city. Of course, manufacturer reports are rarely duplicated in real life but, accepting as gospel, how does it measure up against its primary competitors; namely the Subaru Crosstrek, Honda HR-V, Mazda CX-3 and Jeep Renegade? In this case, the Trax does fairly well, showing a nominal difference from the HR-V’s 24/25 mpg rating while falling short of the CX-3’s 34/27 mpg. Thus, it falls in the middle, bridging the gap to both the Crosstrek and Renegade, which fail to fare as well. With an average fuel economy rating, average performance ratings, an accessible price point and some versatility (but only if all-wheel drive is opted for) is it any surprise that the Trax still isn’t blowing our minds? Perhaps the Trax is redeemed within the arena of superficiality? Well, most commonly described as exhibiting “no-nonsense styling”, the Trax boasts a very conventional, no-frills design philosophy. All-too-familiar notes like a smooth rear elevation and prominent bumpers serve to remind you that you’re looking at a crossover, but the absence of defining characteristics does the Trax a major disservice. It’s almost anti-Mazda in its realization. Whereas the simplicity of Mazda’s KODO design philosophy does justice to the CX-3 and its cohorts, Chevy’s decisions feel somewhat lazy. Unfortunately, this – combined with the Trax’s price point – help to carry this criticism over to its interior. Despite being perfectly comfortable (perhaps even more comfortable than certain competitors) the Trax isn’t much to write home about in terms of its hard plastics and uninspired material choices. But the Trax DOES benefit from the inclusion of Chevrolet MyLink’s touchscreen interface (one of the best on the market) as well as their signature inclusion of technology, both standard and optional. Favored among that of most competitors, Chevy’s option of 4G LTE Wi-fi only serves to complement their smartphone integration (Apple CarPlay & Android Auto) and Bluetooth connectivity. So How Does the Trax Measure Up? Bottom-line…it’s good enough. Relatively average and unthreatening, the accessibility of its price echoes through its entire demeanor. From the perspective of the average driver, my biased criticism is exactly that…biased criticism. So, there’s absolutely no reason why someone who views their vehicle as a practical means-to-an-end. The Chevy Trax sure as hell doesn’t offer “performance pep” and it never even stood a chance of being anyone’s “perfect off-roader”.